An analysis of 1 million URLs ranking on page 1 of Google to determine the factors that contribute to higher rankings in the search engines. This is a difficult question to answer because it depends heavily on a whole bunch of variables related to your brand, current situation and the kinds of topics that you’re looking to gain visibility around within the search engines. That said, there are a lot of interesting insights to be had from analyzing a large data set of top-performing webpages. In order for me to give a holistic overview of the factors that are influencing search engine rankings, I need data. Luckily, data is what I have. With the help of the amazing team at Accuranker and also Ahrefs, I’ve gathered a huge variety of data points on over 1 million different URLs that rank on page 1 of Google. I also had the help of the amazing, Dimitris Vlachos, who supported on the data collection and organization. I’m now going to share the distilled findings from the research so that you can understand both the ways that Google is evaluating the webpages that it ranks, as well as highlight the tactics that top websites are using to dominate the search engine results page. Backlinks matter. On average, the top 2 results on page 1 of Google equated to having 38% of all the backlinks from pages on page 1. On average, the higher up page 1 the result is, the greater the number of linking domains that the webpage has. Webpages ranking #1 had an average of 168% more linking domains than those ranking #5. Webpages on HTTPS had positive correlation with higher rankings, with 33% of all the sampled URL that ranked either #1, #2 or #3 using HTTPS. 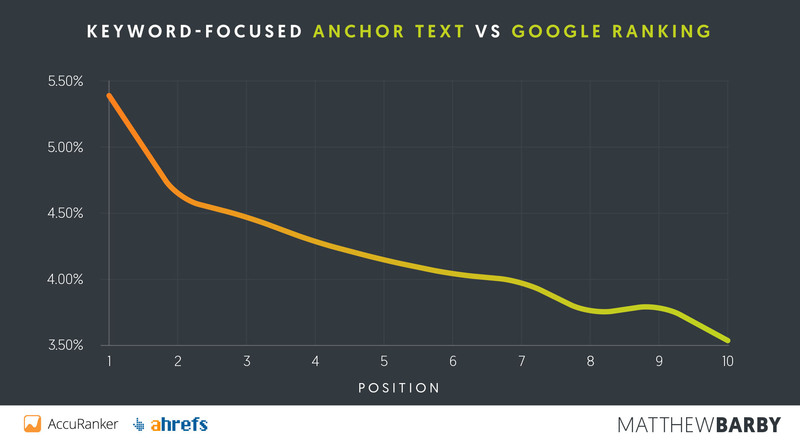 Anchor text is still a huge ranking signal. Webpages ranking #1 had an average of 5.42% of their anchor text actually including their target keyword. The further up page 1 you look, the higher this percentage goes. Top-ranking webpages tended to have shorter page titles, with the sweet spot nearing closer to 8 words in length. Webpages with their target keyword in their URL tended to rank higher in Google than those that didn’t. Including your target keyword within your page title positively correlated with higher search rankings. Of the sampled data, over 15% of all the page 1 rankings included the target keyword within its page title. Across the results of page 1, the average ratio of backlinks to linking domains was 37:1. This means that on average, each website that linked to page 1 content was linking from 37 different pages on their website. 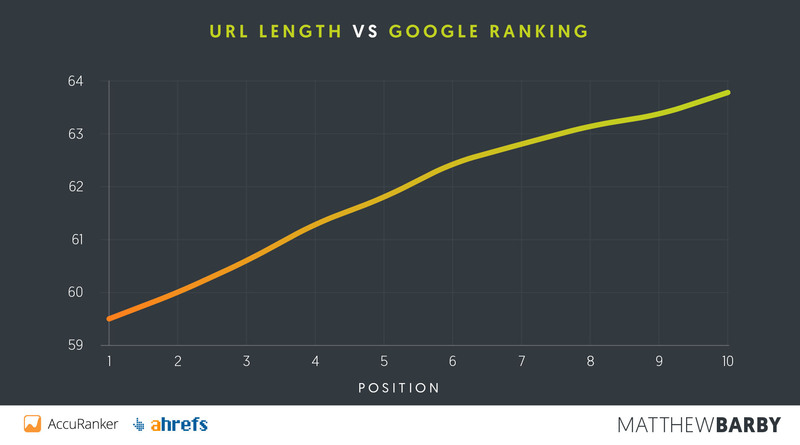 Top-ranking webpages in Google have shorter URLs, with position 1 URLs averaging 59 characters in length. Learn SEO that actually works. Join a private SEO community and get the personal advice and support you need to advance as an SEO. Skip the guesswork and learn directly from me and the experts behind six-and-seven-figure growth for billion-dollar brands, affiliate sites and businesses of all sizes. A random sample of 100,000 keywords were taken, and each of them had a minimum monthly search volume of 100 searches. From these keywords, the top 10 results on page 1 of Google.com were extracted, resulting in a total of 1 million URLs. For each of the URLs, data was gathered related to their SERP snippet (thanks to Accuranker) and their backlink data (courtesy of Ahrefs), as well as a wide range of HTML elements from the page. If you’re a regular reader of my blog then you’ll know that I’m a huge proponent of link building. As the data shows, this is one of the biggest factors associated with earning higher rankings in Google, and this is definitely what I’ve seen to be the case from my experience in running successful SEO campaigns. The chart quite clearly shows a gradual increase in the number of backlinks that a webpage has as you move higher up page 1 of Google. One of the traps that I often see people fall into is falling for the “create great content and you’ll rank” line that gets thrown about all too often. Great content isn’t enough. 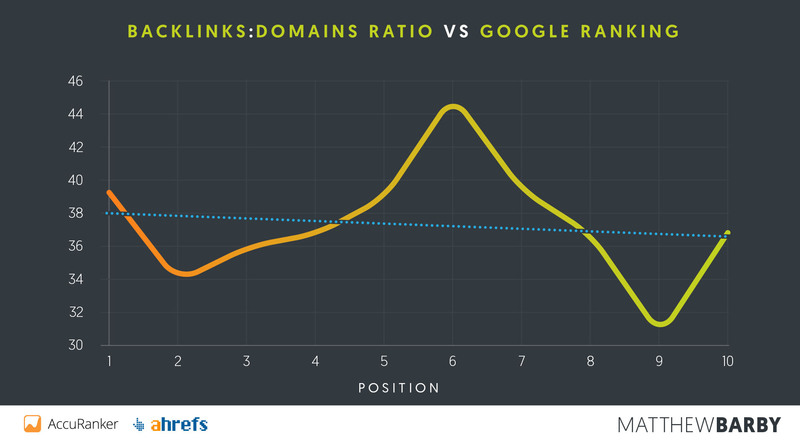 The long and short of it is: if you don’t have backlinks, you’re not going to rank. Action: go through your existing content and identify pages that are underperforming in organic search. Go through my SEO tips guide and test out some of the link building techniques to acquire more backlinks to those pages. We know that earning backlinks to content is important, but how important is it that the backlinks are coming from different websites versus the same one? Well, the data clearly shows that it’s really important to have a substantial amount of diversity in the domains linking to your webpage(s). This is probably one of the most clear-cut factors that equate to high search engine rankings. In fact, the data showed that, on average, webpages ranking #1 had over 168% more linking domains than the webpages ranking at #5. 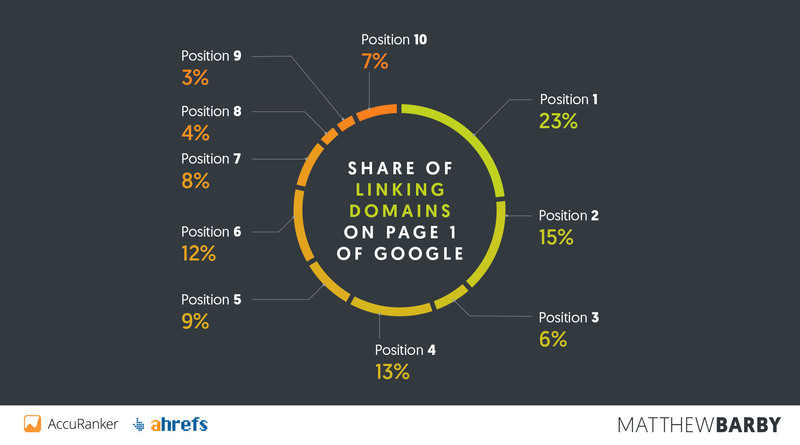 This is even clearer to see when you look at the fact that webpages ranking #1 actually receive a 23% share of all the linking domains pointing to webpages on page 1 of Google. Higher volumes of backlinks are great, but combining that with high diversity is what’s really going to move the needle. To give you an idea of the general ratio that you may want to aim for, I looked at the average ratio of backlinks to linking domains that results ranking on page 1 of Google.com had. As the trendline in the chart above indicates, the average ratio of backlinks to linking domains that page 1 ranking webpages had was 37:1. It’s worth noting here that this isn’t necessarily what you need to “aim for,” but rather it should be used as a benchmark to determine whether your current backlink profile could do with an increase in domain diversity. Action: Use a tool like Ahrefs to analyze your ratio of backlinks to linking domains. If you find that your backlinks are mainly coming from a small pool of domains, look at a way to diversify your backlink strategy to get links from a greater variety of domains. Anchor text has been a huge talking point within SEO for many years now. Most of Google’s major algorithm updates focused around weakening the impact of having backlinks with keyword-focused anchor text, but it seems like it’s still a huge factor towards ranking. This isn’t a big surprise to me. I’ve seen this factor more than any other to create huge upward movements in search engine rankings. I talked a little about this in a study I did of the HubSpot blog, where the 100 top performing blog posts had, on average, over 80% more keyword-focused anchor text than the rest. The chart shows that results ranking #1 on page had an average of over 5.4% of all their anchor text containing the keyword they were ranking for. In fact, over 1.2% of all the #1 ranking URLs that I analyzed had 100% of their anchor text containing the keyword they were ranking for. As the chart above clearly illustrates, webpages ranking higher in Google had a much larger proportion of their anchor text containing their target keyword. Ultimately, it seems that keyword-focused anchor text is an important ranking factor, and this was even more evident in the upper quartile of search volume keywords sampled. Action: Work on acquiring backlinks that have your keyword present within the anchor text of the link. It’s important not to overdo it here, but it’s also important to not neglect it altogether. The page title and URL are two of only a small number of elements that are present for a user to view within the search engine results page. It’s fair to say that they have a huge impact on click-through rate from the SERPs. I’ve run a number of studies over the page year relating to click-through rate from the results page and have seen very strong correlation between this and higher search rankings, even if Google’s official line is that this isn’t the case, at least as a ‘direct’ ranking factor (don’t believe everything you hear there). One study that I ran earlier this year enabled me to jump from the middle of page 2 for a high-volume, competitive keyword to the top of page 1 within 15 minutes. Now tell me that it’s not a ranking factor. The reason why I’m talking about click-through rate is because desirable SERP snippets, like the one shown above, tend to receive a much higher click-through rate, thus receiving a ranking boost. Understanding what makes a SERP snippet ‘desirable’ is a huge advantage. For larger websites, especially those within e-commerce leanings, there are huge SEO wins to be had with snippet optimization. One of my favorite examples is from Etsy, where they ran a really interesting test across page titles. Thumbtack ran a similar experiment too. 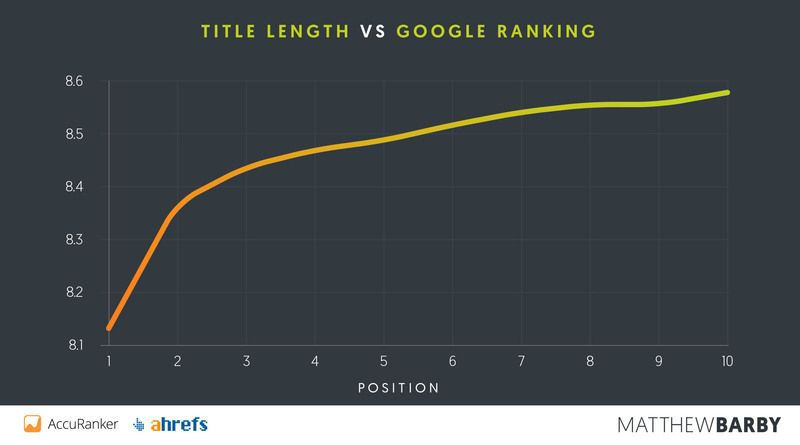 The chart above shows that the title length and Google ranking are intertwined. 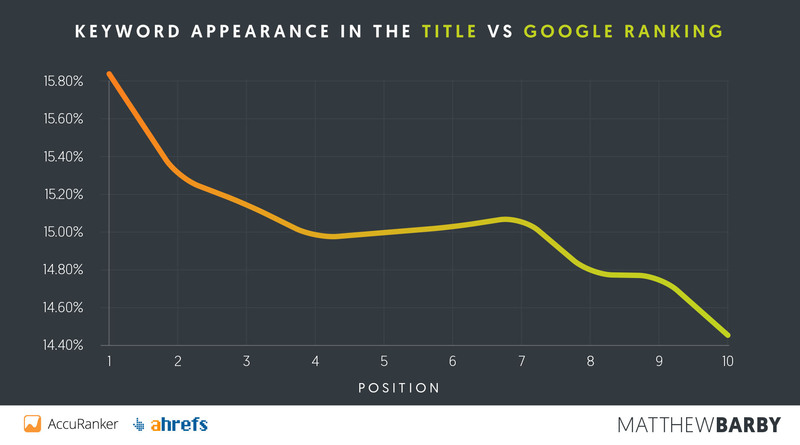 Shorter titles correlate with higher rankings in Google. Longer titles end up being cut off in the search results which means a key part of the phrase could be lost, making it less desirable to the user. Shorter titles tend to get to the point quicker and enable the user to very quickly determine if the result will fulfil their initial need. 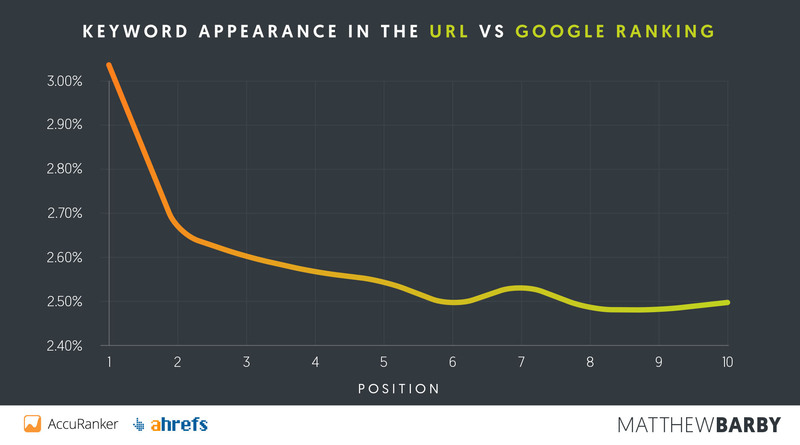 On top of this, I looked into whether the length of the URL had a relationship with Google ranking. It’s quite clear to see that there’s a similar relationship with short URLs as there is with page titles. Longer URLs tend to look a little more spammy within the search engine results page, and this is amplified if there are a lot of numbers and symbols within them. If a URL is too long then it misses out on the benefit of having any keywords within it bolded, which will likely draw more attention to the user. Action: Pull a list of all the URLs and page titles from your website using a tool like Screaming Frog SEO Spider. Export the data into Excel and then calculate the length of each one using a simple LEN() query. Quickly identify any page titles and shorten them down to ensure they’re as succinct as possible. As well as the length of URLs and page titles, I tested them to see if the presence of the keyword that the webpage was attempting to rank for would have an impact on higher rankings. The results were similarly conclusive. The assumptions that I’d make to explain why this is the case have less to do with the keyword’s presence in the page title being a strong on-page SEO factor, but rather having a relatively large influence on the click-through rate of the search snippet. Probably the most obvious reasoning behind this would be that the searcher will gain immediate affirmation that what they’re searching for will appear within the webpage displayed. I can’t stress enough the importance of paying attention to this. An interesting (and free) tool to measure the impact of changes made to page titles is Tom Anthony’s SERP Turkey tool. If you’re interesting in running some tests then I’d highly recommend checking it out. The story remains the same for the presence of keywords in the URL. If anything, this is a little more conclusive, especially in the #1 position. There’s an added reason why I believe this can be more influential, and that’s the fact that any mentions of a keyword in the URL will be shown in bold, which draws their attention to it more than those not mentioning the keyword. Just look at this example when I search for “SEO Tips”. You can quite clearly see the added emphasis placed on the phrase “seo tips” within both the URL and the meta description. Action: go through your existing content and make sure that the primary keyword you’re targeting is included. For any new content that you produce, try to ensure that the keyword is used within the URL. Avoid updating URLs of existing content because there are greater risks associated with doing this than the potential reward. Google has come out and said that HTTPS is a confirmed ranking factor. That said, they haven’t actually confirmed how much this impacts search rankings. From the dataset analyzed, there was visible correlation between HTTPS and ranking higher in Google. All of this to one side, HTTPS is likely only going to get more important. Google is pushing the message of secure browsing particularly hard at the moment, and they will soon be showing much more obvious warning messages to Chrome users when they visit HTTP sites - as you can see below. One would assume that this shift towards HTTPS stretches far beyond just security, but rather opens up the opportunity of greater browsing speeds through the rollout of HTTP/2. Considering that at least 33% of all webpages ranking in position 1, 2 and 3 were using HTTPS, it’s relatively clear to see that this is the way the web is heading, and more importantly, the standard that is being set for websites looking to rank well in Google. Action: If your current website isn’t using HTTPS then you should start scoping out a migration. A good guide on switching over to HTTPS can be found here that will go through the necessary steps involved. This results that have come from this study should help guide you on the prioritization of your SEO campaign(s). That said, there are always slight nuances from one campaign to the next - my advice is to always test within your own situation. Use the findings that I’ve gathered to build your initial hypotheses as well as using them as a ‘best practice’ guide, but ensure that you and your team are consistently experimenting so that you remain up to date with any changes that happen within the search engines. I’d also recommend reading through my SEO tips guide that should give you a bunch of inspiration on experiments to run yourself. Finally, I’d like to thank the amazing teams at Accuranker and Ahrefs for supporting with this study. If you’ve not used their tools before then I’d highly recommend checking them out. Wow. Thanks for the great research. It strengthen some existing theory. But also reveal some new and exciting findings. Super insightful and data-driven once again, thanks Matthew! Thanks, Marcel. Glad you found it useful! Seems to me like Google is trying to get people used to shorter Titles and descriptions, so the search results will look more like AdWords. So that at some point people actually will think they are the same. I think the key here is that users tend to click-through on results with shorter titles that clearly get across what the page is about. I’ve seen CTR to be an enormous ranking factor for content on page 1 of Google, so this makes a lot of sense to me. Would this work to rank also a web 2.0 page (blogspot, weebly)? especially if it’s not a one page web 2.0, but a more developed blog? This applies to all webpages – this is the basic underlying principles of how Google ranks content. Very detailed! Not a big fan of axis that don’t start at 0 though, makes some of the factors above look a lot more pronounced. Worth a mention about Correlation != Causation too. Could these numbers also be a sign that a few players are using the same game book? Let’s say all who work with backlinks also work hard on their onsite seo. Then its hard to say if its the backlinks or the onsite work that boosts the websites. The funny thing is, I did the same SEO back in 2010 and the same strategy still works in 2016. Optimise the page content, have relevant and clean meta data and increase the number o linking root domains to the page. How you get the linking domains it up to you, sponsored posts, guest posts, etc. The best in 2010 were in-content article links and today it’s still the most effective way of link building. Thanks for this. I just started using longtailpro and it’s a great tool for keyword search. I changed the keyword within a couple of posts and it made a big difference. Now I’m going to concentrate on getting more backlinks from sites that relate to my blog. Thanks for the stats! Have a good one! Agreed, Qualified inbound links are the top focus for me. I pitch heavy outreach for any campaigns these days. Dig the new layout of the site as well haven’t been here since the growth hacking saas article! Thanks, Cody. Recently went live with the new design so glad you like it. What in there is actually “new”? Hey Steve, to be honest, the main takeaway here is that the way Google is ranking content hasn’t changed all that much (contrary to what a lot of blogs say). Another question : is there a correlation between Citation Flow : Trust Flow ratio of majestic and Google Ranking ? Hey Majed, that’s not something that I looked at within the study, but from my experience, Majestic’s metrics are fairly reliable to use as a general guide. Nice information for SEOs I would rather say quality and quantity for backlinks and good to hear from you that https is a ranking signal because previously heard lots of rumors that it decreases website speed etc. But I believe it’s very important for a website to be secured and all the mentioned factors are important for a website doing seo, thanks for this huge information. These are awesome insights and very useful. These basic things are so important and one must put these to there checklist. Matthew, first of all, thanks for the great info. A question: what’s a realistic CTR, what’s a good CTR and what’s a great CTR? It varies a LOT depending on the type of query being searched. For SERPs where you have a Featured Snippet, you can see a CTR of over 50%, and the same goes for branded search queries. Conversely, a CTR of 20% for a broad commercial keyword could be very good. It’s one of those measure you have to look at in a relative measure. Nice Article very much insightful. Its my first time here, the site is great but the content is greater. Keep up the good work Matt! 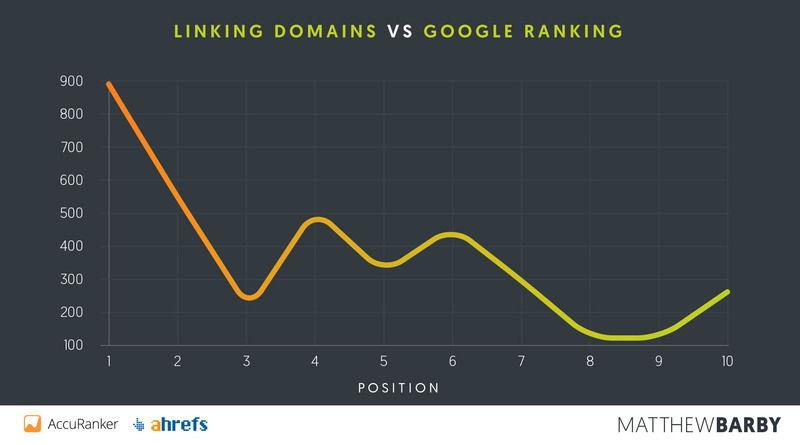 I strongly agree with the point of more backlink is equal to higher ranking. Is it possible that this is only the result of Wikipedia and Youtube often ranking on the first positions? Hey Julian, that’s a good point, and I actually removed Wikipedia from the dataset to see if there was a big difference, but the results still held true. Good interesting post,- going to go through site and shorten urls as we have quite a few long ones. Just one thing to be careful of here – don’t go and update existing URLs that are driving a lot of organic traffic as you may risk losing rankings in search. I’d use this new structure for all NEW content you publish. Great Article, so far the most important factor i came to know is Backlinks, but question is how to create quality backlinks? That’s great and extremely helpful. Your Blog is one of my must reads! One question I have though. What about SERP URL appearance? Is it better to have full URL or breadcrumbs? That’s not something that I’ve ever really tested, to be honest. One I’ll add to the list. No Dought it a great article. Thanks for your informational data and well written. I will follow your further article to improve my site rank. Nice article.. Page loading speed is also ranking factor. Have you tested it for all the 1 million URLs????? I haven’t. It’s something I really wanted to do, but as you can imagine, it’s not an easy data point to grab across this dataset’s size! I’m definitely going to do this though. Interesting Read. You have put all the necessary factors for ranking in this article. Great job. Great info Matthew barby, I also noticed similar findings but you wrote it very well. 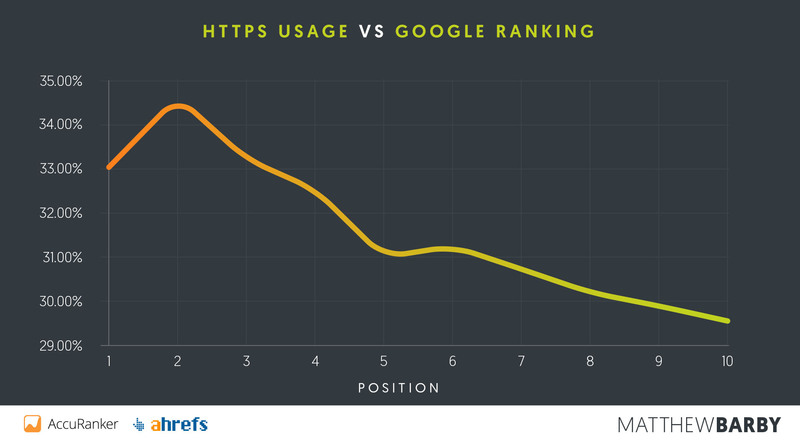 I think HTTPS can influence ranking better ways. making short titles with some attractive captions also increases the visits. I have recently applied your google ranking formulas on one of my startup (https://www.latenightbirds.com). The result was amazing. Fantastic article. Glad I came across this. Thanks for making the action items so clear. But you didn’t mention about backlink quality and co-citation. If I make a backlink from other niche site then it fruitful for my website or not? 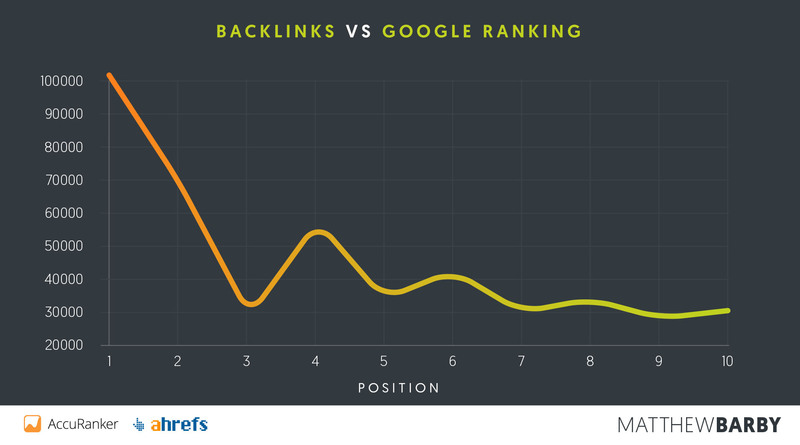 Backlink quality is incredibly important. I purposely didn’t go into it in too much detail because of the fact that most of the ways of measuring this aren’t overly great. The TL;DR here though is that backlink quality is incredibly important. Nice to see someone championing the use of backlinks once more. Anchor text is still something which should be feared but not coddled… with the correct use of on page seo signals in title tags, short urls and the proximity of keywords within urls (as you say in the article) read more and click here are still my first pick. This is good suff. Definitely want to learn more. Great research and some points really surprised me more than others. This effort and publishing is much appreciated. I like your research results for us internet marketers, that the ranking in the top 10 of Google is highly influenced by backlinks, even Google is proclaiming different. Great article. Some of my views have been validated while other have been questioned. However do you think the length of the content is a ranking factor? Great article. I would agree with everything you said except I do not understand why most SEO firms insist on saying the opposite in many of your examples. Great list, please add more as you find them. Great study and a good read. Appreciate all the work you put into this. What I am seeing from this study and what I’ve been noticing from my own research is similar and unfortunate. Spam still works and it works well. Content stuffed with keywords or the same content with only the “city” content changed, ranks very well even though G says it wont. Low quality directories with KW rich anchors work well. Spam links work great. Attain as many links as possible and don’t worry about the quality. This is probably not a strategy for the long term but its been working for the past several years. Thanks for the article! This interesting stuff. Have you had a chance to do any multi-factor analysis? For instance, if 15% of #1 ranks include the keyword in the title, then that means that 85% don’t (which is a much stronger argument). However, where there any combinations that were more successful? 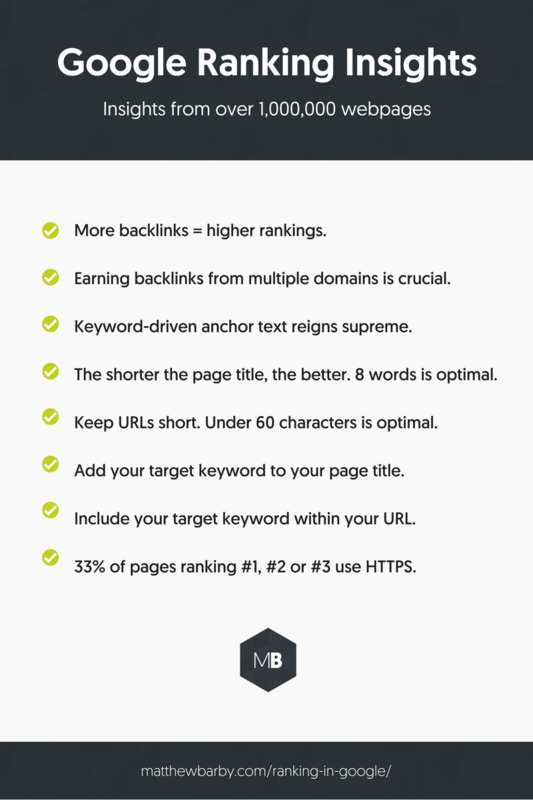 Where you able to get over 50% when you combined title and URL keywords, backlinks over a certain threshold and title length? Just curious. Very interesting study I’ll share with my readers mentioning your great job. Google just doesn’t seem to get over the backlink factor. Thank you for precisely putting the numbers. These results will certainly bust a lot of myths. This is really a useful content. i appreciate the strategies! Great findings, Matt! One of the best out there. Would you be able to do a research on whether the no.of outbound links has a correlation to higher rankings? There are a lot of seo “guides” out there that recommend linking out to high DA domain like Wikipedia to gain more trust from Google which results in higher rankings. However, there isn’t any study done that actually proves this finding.